6 Weeks and 1 Day - Twin Surprise! Went for my first Ultra Sound and was asked if this was In Vitro, I of course said no but I just knew there must be something up. After quite sometime she turned the monitor to me and sure enough there were two sacs. I could not believe my eyes. Totally scared at first but now what a blessing! Can't wait for them to show their faces to the world! Comments for 6 Weeks and 1 Day - Twin Surprise! I had my first ultrasound the day after you and I'm also 6 weeks pregnant with twins! The nurse scanned back and forth and then looked at me and my husband. She said "Well...." and I swear it felt like an eternity-long pause. "...you have TWINS!" My husband was speechless, but I voiced what he was thinking. "WHAAAAAAAAAT????" 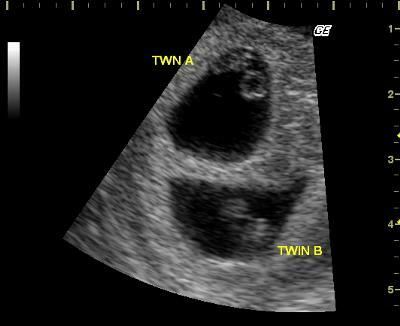 We had just discussed the fact that there was no way we would have twins since it doesn't run in either side of our family. I joked about twins because I am a late in life mom and wanted 2 but know I should only try for one, safely. We called our mothers to tell them the news and they told us that we DO have twins on both sides of the family. I also found out that after 35 mothers have a higher rate of twin pregnancies. Congratulations to you and best wishes for a happy, healthy pair!